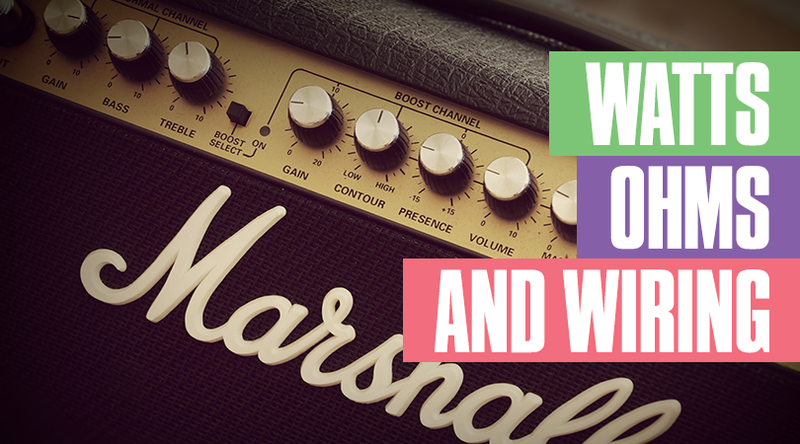 How many times have you plugged your guitar into guitar amps, and it just works? Amps, big or small (and there are some really great small ones), are the foundation of tone. But what if the amp is broken? What do you do? This happened to me a few weeks ago. My younger brother’s combo amp had a mind of its own and often decided to cut the music whenever it felt like it. Worse, he had a gig in just five days. And so, our little odyssey of finding a replacement amp began. 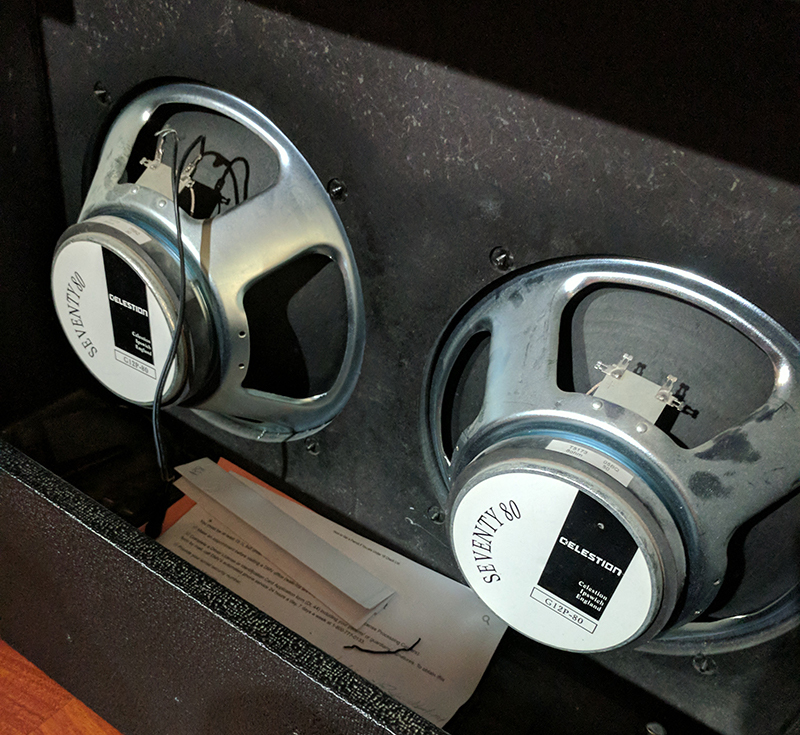 We decided to salvage the speakers in the old Crate combo and began searching for an amp head that could run two 12 inch, 8 ohm, 80 watt Celestion speakers. And then it hit me. I had no idea what an Ohm was, or how many watts a power tube provided and how that corresponded with a speaker’s wattage, not to mention, the type of wiring a pair of speakers used. I thought amp heads simply worked with any combination of speakers, but that is not the case. If you want to salvage the speakers of a busted combo amp, you’ll have to first take note of the speaker’s wattage. For us, it was two 80 watt speakers, 160 watts in total if we decided to run both. After some research, and forum sleuthing, I came upon this discussion. The basic rule is, your amp head’s power output, usually indicated by watts, shouldn’t exceed the wattage rating of your speakers. If my amp is rated at 200 watts, and I was powering a 100-watt speaker, then the speakers would probably blow after turning the volume up past 5 or 6 because amps use more of their power at higher volume. I think of it this way: if your amp’s volume is at 0, it’s using the minimal amount of power, but if you turn it up to 5, then it’s using half of the power, and turning it all the way up to 10, the amp is using 100 percent of its power. Amp wattage can also be used to determine overall amp volume. This is why smaller amps, rated at 10, or 20 watts are quieter, but they also naturally distort as they reach their power and volume limits, giving you that really nice, warm, vintage tone everyone is looking for. On the other end of this, is your speaker. You want to think of a speaker’s wattage as how much power it can take from the amp before it surprises you on stage, or during practice. For my situation, we needed to find an amp head that wouldn’t blow past 160 watts. Once I understood a bit more about wattage, I took a deep dive into ohms. Ohms are arguably more important than understanding your amp and speakers’ wattage. The two speakers I was working with were 8 ohms each. This meant I had to find an amp head that supported two 8 ohm speakers. Amps, generally, are able to handle 4, 8, and 16 ohms. Ohms measure resistance, but I won’t get into the technical details. You want to remember that your amp should never be set to a higher ohm than what your speakers are. For example, if your amp is set to output at 8 ohms, and you have a speaker rated at 4 ohms, you risk literally blowing up your speaker, since the amp is outputting way more power than what your speaker can handle. It’s pretty dangerous, don’t do this! You always want to match your amp ohms to the speaker ohms or keep your amp’s ohm output at a lower setting than the ohm of your speakers. If you have an 8-ohm speaker, and your amp is set at 4 ohms, you’ll be okay since your 8-ohm speaker would be able to handle the weaker signal from the amp. But what if you’re working with multiple speakers? That’s where the wiring comes into play. When using multiple speakers with your amp, they’re usually wired in “parallel” or in “series.” If your guitar amp’s speakers are wired in “series,” this means, you simply add up the ohms of each speaker and that’s your total ohm count. For example, I have two 8 ohm speakers, and if they’re wired in “series,” that means my speakers have a total of 16 ohms. This means, you can run your amp at 16 ohms and your speakers won’t blow up because they’re matching! You can also run your amp at 8, or 4 ohms too because, again, your speakers are 16 ohms in total and can handle the lower load from the amp. 8 ohms / 2 speakers = 4 ohms total. With a maximum ohm load of 4, this means I would have to set my amp to 4 ohms because we always have to match ohms. Again, you only have to do this if your speakers are wired in parallel. And the only reason I know this is because the amp my younger brother and I got was a head that required speakers to be in parallel. Two days before the gig, we eventually went with a Bugera V55HD amp head that took both of the 8 ohms, 80-watt speakers in parallel, and it sounds good! Wow, that was a lot. But if you made it this far, congrats, you now know a bit more about your gear, and ways to save your equipment from literally catching on fire. But just to be sure, let’s recap. - More watts equal more volume. Make sure the number of watts your amp outputs doesn’t exceed the number of watts your speakers can handle. And no one really needs a 100-watt amp if you’re only playing at home! - Never ever use an amp head with a higher ohm than your speakers, this will almost certainly blow your speakers! - Add up the ohms of the speakers if your speakers are wired in series. - If you speakers have the same ohm rating and are wired in parallel, simply take the single ohm rating, and divide it by the number of speakers to find the total ohms. Alright, that’s it! Now go out there and play until your heart is filled with glee and your fingers are full of blisters. And please, try not to blow anything up.